Nursing students voiced their upset towards the DCU Students’ Union for a lack of participation in the recent industrial action taken by the Irish Nurses and Midwives Organisation (INMO). DCUSU organised a coffee morning to show their support for the 800 nursing students on campus and the all-out strikes. However, DCU nursing representatives said it was not enough during the first Class Rep Council (CRC) of semester two. “I come home on the verge of tears because of the environment of placement,” said nursing class representative Ciarán Mac an tSaoir who asked the SU to “do a little more than a coffee morning,” to show solidarity with the INMO and the future nurses being trained in DCU. The coffee morning was held when three quarters of first years were rostered for clinical skills so could not attend the event, while third years were on placement and fourth years were away on their internship. “We are failing in our job there,” said DCUSU President Vito Moloney Burke about how they have treated the nursing students on campus while the INMO take national industrial action for the second time in 100 years. “Sometimes we need a kick up the a*se,” he added at the CRC. “I suppose the book stops with us and sometimes you just need to face up and realise that you are doing things wrong. You need to stand up and take a shift in another direction and listen to those around you,” he said. Members of the SU are meeting with nursing students next week to devise a plan going forward. During the CRC another nursing representative said she sent an email to DCUSU VP for Education and Placement Craig McHugh and VP for Engagement and Development Karl McGovern seeking more support from the SU for nursing students. McHugh stated he would look at his emails however the nursing rep then said she sent it in November of 2018 and did not receive a response to her query. 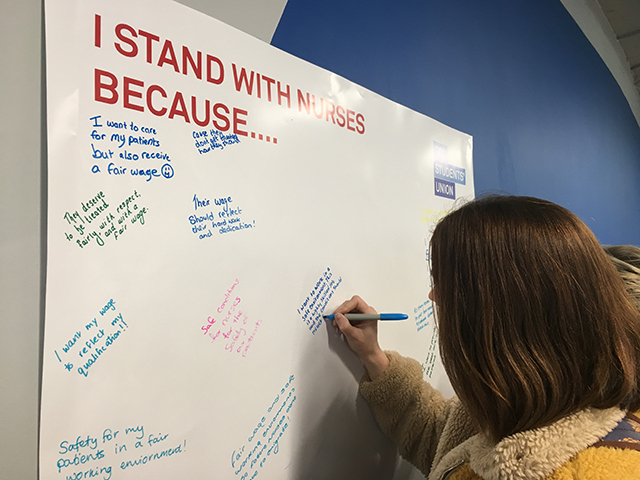 After the first 24-hour work stoppage, the SU helped organise a photo in solidarity, however, only second year nursing students were involved which resulted in first and third year nursing students organising their own solidarity photo. “I feel like we’re not being listened to,” said Mac an tSaoir. Mac an tSaoir suggested that more emphasis be placed on physical and social media campaigns for better conditions for nurses, midwives and students studying these professions. “The pity is that we really did have a big concerted effort to tackle this issue. It’s just a big shame that it was channelled in completely the wrong way,” Moloney Burke told The College View. The SU are organising buses to go from the Helix on Saturday for the Stand with Nurses and Midwives rally and made a video today, during the coffee morning, on the Stand With Nurses And Midwives campaign.